Apparel Website Is Banned from Payment Processor Evalon for Selling Ocasio-Cortez Is an Idiot T-Shirts - Considered "Hate Speech"
Enrique Tarrio runs a popular apparel website known as 1776.shop. 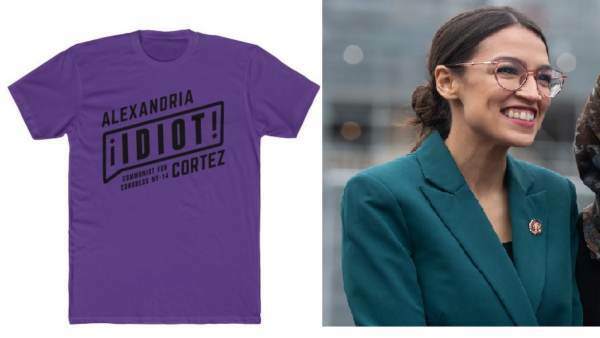 Recently Enrique was dropped by payment processor Evalon for selling a t-shirt labeling Congresswoman Alexandria Ocasio-Cortez an “idiot” and “communist”. This isn’t Nazi Germany, Stalin era Russia, or some repressive third-world regime where questioning the government can land you in prison or a pine box… this is America. “We have the right to question our government and our elected officials in America. To think that someone could be punished financially for calling a member of congress an idiot is insane. Honestly… it’s an example of fascism in action to do something like that,” Tarrio explained to The Gateway Pundit. His website has faced problems before with payment processors, but a vanilla t-shirt calling AOC an idiot is an odd thing for Evalon to highlight in their reasoning for shutting him down. 1776.shop houses thousands of products, including the iconic “Roger Stone Did Nothing Wrong” t-shirt and hundreds of other pieces of apparel and collectibles targeted towards freedom loving Americans. Tarrio confirmed that the deplatforming effort by Evalon has been resolved and that 1776.shop is back up and running. Just last month, the Chase shut down his longstanding personal bank account for no reason. If President Trump does not work to address the censorship and deplatforming efforts taking place before the 2020 election, he might not have many allies left to help propel him to a second term. That is why it remains vitally important to support alternative news like Gateway Pundit and entrepreneurs like Mr. Tarrio.